In this context the artist has to create an alphabet for shapes that can be widen along with the expansion of vision and culture, and since the art work is a transformation according to the self conscious theory; therefore I try to create a concept of the art work that challenges the reality and the viewer. I see awareness is increasing of the people who are interested in the art work after they are provided with sensual and aesthetic experience that enables them to communicate with the real concept of the work despite of its mediums whether it is clay, paper, fabric, poetry or novel … because art is much more profound than this. The art work is not meant to be a gift to someone nor to be hanged on some wall at any where, but it is a mine where the creator finds himself and through it he can explore his abilities and potentials to participate in creative. Art and life have a dynamic and controversial relationship. Life is deep and infinite source for art creation and creativity. After achieving the art work it becomes a tool to heighten human level and to deepen his vision towards life. In fact the visual art work is unveiling the mystery of what is hidden in the place, whether they are visual arts or any other modern arts in a form of overlapping web that consists of signs, lines, things and images. Actually I deliberately attack medium and things seeking more understanding of this world, therefore my relationship with the present traditional art is tearing down and exceeding. For many artists who have been through an experience attempting to reach a profound understanding for the material nature and how to handle it; it seems that they have been going back and forth in their places, that's why you see them unable to create art work featuring both originality and seriousness despite of their starting off from art postulates, where art confirms the urgent need to search for new visions in art that are able to create a specific and a magnificent revolution and to read it more profoundly and to be written about it through a complete free prospective and away from the previous theories and the traditional sayings, because only the art work is allowed to compose theories that are originate and to express itself. In these days if we look at many artists work we would find the majority of it are marked by repetition and mimicry as if they do not have the desire to create a new concept that is more profound, more open and evident, or as if they believe in the principle of casting the art work and keeping it as a prisoner of a very old fashion theory. It is now the time to search for new concepts and to establish for others that go along with IT revolution in this era. Who can make the new dazzling art work which indicates his wide imagination that springs from a deep understanding of the material nature and its developing history is a genuine artist who rightly enables him to grasp the genuine moment of the art work birth. "if you do not change your thought when you look at a picture you never seen before; either you are stubborn and stupid or the picture is not good"
From here my journey has started to understand the art work nature and to comprehend its essence and at the same time trying to know myself through a careful reading and examination in a different approach which has lead me to believe that accomplishing a good work is not the end of the journey no matter how long the road was but actually its just an answer to a question that might rise another one or many more, or its just a moment of new birth of a new vision. deep and related to the philosophical and beautiful side which makes us wonder about things and age. It represents the progress and development of self consciousness beside the boldness in creation from additives-repetition-deleting-and space, thus the modern ceramic art invites us to create an alternative space and to concentrate on the modern concepts and developments that took place in this field during the last years. So, the show space has become the inspiration of the ceramist to compete about the theories and ideas of the ceramic art within the profession itself; at the same time there was an unveiled goal to the viewers’ expectation. 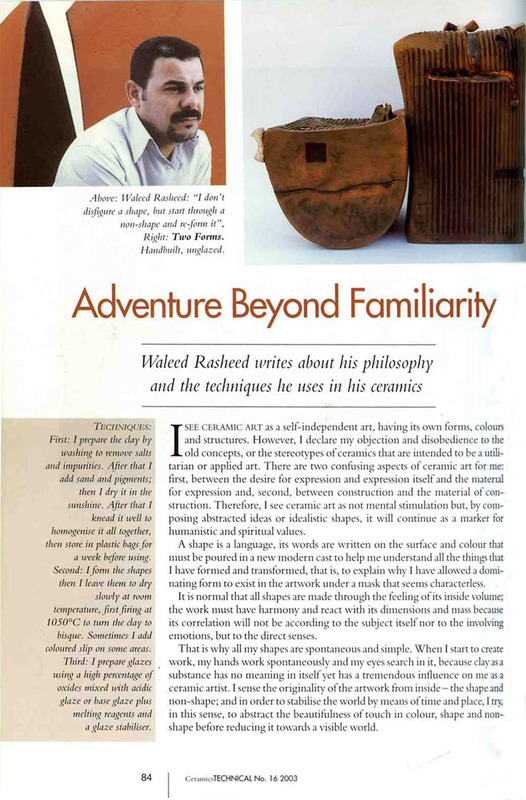 Through out my readings and researches of important experiences which are carrying good concepts, most of the works were a perfect field for adventures with a purpose of concentrating and creating in the space of the show. In one of the galleries in Europe several ceramist were invited and they had a free space to prepare the materials and to use them in a perfect way to present the show and to build their works. This good new opportunity of showing and dealing with the surrounding space has become a completing factor to the show concept, these shows were professional and concentrated on the discovery of the material and space and finding out the interior mysterious, so the art work creates a human who is qualified not only to see but to live his age. (its hard to translate the experience into words like eating or drinking because the essential need to be an artist is to do something visual). That’s why I have a little suspect about creativity because I believe that the power of creativity is something special lies in every one but in time some of them loose part of it while others know how to keep it and even strengthen it. Art creation process requires a high skill to understand it and to make the material because the material is the most important thing here and who are called (professionals in art) are who go far beyond this concept, these people became the material it self and if each one of us starts to think this way, many techniques and concepts will start to change in a way of getting out of creation process and not getting inside it. To create an empty space in its essence, to create amazingly …..
· Why do I choose this style in presentation? · Why do I prefer the original materials to fulfill my creativity? · Why do I choose this style to solve a certain problem? · Why do I attack the surface of the work with lines and additives? · Why do I commit to the shape of this pot? · Why do I respect my work? All these questions and more are struggling inside me while I am working or thinking through the crowded things and shapes around me…at first these questions were so difficult for me to answer but when I reviewed my artistic journey in a way to realize the reasons behind my choices during all this period, I have found the answer by practicing a continuous work and discovering the shapes of things, breaking them and then attack the surface after shaping them with lines and additives. I still remember when I studied fine art in Baghdad- I had no experience in ceramic- my professor used to teach me the skills and techniques of this art but at that time I was convinced that no matter how much skills and techniques are important ,they are not the real and the final scale for evaluating things; therefore my love and belief in materials made me despite of my naive experience at that time; to think deeply and work hardly to develop my artistic articles and to create new art works worth wondering and questioning about what they look like out of the ordinary. Today, when I remember my old days in studying I realize that I had good professors and their criticism beside my friends’ criticism made my way of success and helped me to realize the weakness of my first experience. So my judgment on the art work is no longer depending on the artistic skills but on other important aspects, because art goes beyond the skill to reflect the deepness and the complex of the experience. When the artist sits on his wheel to make many ceramic pots without having deep experience and smart curiosity; his work can not have the art shape, creativity and sensitive feeling which the art would include; and without it the work would loose its influence and become just a pot like other thousand ones…. If the artist has been driven by a strong experience in his art work he should not stick to it but to find new ways of his own to develop and to make them different, and also he should not be convinced about the usual ways in making art but he should work hard to search for new ways and styles…..in other words he should be an explorer and always remembering that the creation process has an external shape (surface shape) it is like a skin but under that skin there is a hard beating and a shining soul. Therefore the ceramicist should not loose the whole picture of the work by concentrating only on the (burning) process ….as David Shanz says :( what lies under ashes is the most important thing). 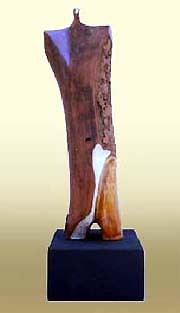 The genuineness in my work comes from the balance between conclusions and discovering new ideas in art languages, that’s what made me talk to the shape of the work so the creation process comes from the inside to express how to deal with the clay, where my artistic journey tracks with its dimension as a visual part in that experience. We may ask ..how should we look at the world? And how should we change the ancient concepts of art? Changing starts by viewing new concepts of teaching in Art Collages and Institutions and finding the way to appreciate and to feel the ceramic art. It is important that self discovery in a different way makes the individual feels like he is living in a modern world that he belongs to without any kinds of complex or lack of feelings and to create a new that balance allows him to grasp the human cultures. Through this open understanding I worked on to achieve a self growth in my work through the relationship with my self on one hand and with the world on the other hand. My pieces of work do not grow from a preplanned mind but from instant decision that allows me to make huge number of art pieces in a long time period through a slow growth to allow changes to happen normally because pushing hard on the work may lead to cause ugliness and humbleness. I believe that art in all its shapes like (painting, sculpture, building) it can be ordinary, cheap or it can be influencing and amazing. strong way; because the artist should do his work as if he lives a warm intimacy moments. It is a shame thing that our culture in general still focusing the attention on the art skills only without focusing on the way to find a new idea. Finally, throughout my journey, I can see that the works that depend only on good skills and techniques without paying attention to the dynamicity and deep personal vision are empty works, meaningless and ineffective. Thus, all artists should realize this truth and avoid getting drifted toward easy solutions and convinced that it is an evidence of wit and cleverness. Thus, the artist today enjoys more freedom with regard to the choice of materials he is using and therefore the material is no more a bond with a certain technical qualities and characteristics. The piece of art now brings its characteristics. The material has it is own touch with which it is born, also, it has its different sensitivity not with the piece of art but by looking at it to the extent that the material has become the essence of the shape not controlling the frame. The piece of art comes to me from an area that I completely ignore and it forms accordance between passionate behavior and stable awareness behavior. This distance sometimes exposes to work disturbances related to work as the form is still separated and remains. The contrast existing between form understanding and the nature of its relationship with the outside space generates some unmade and unchangeable emotions. At the same time I have discovered my contrast with the outside world, my relation with shape and how to create it starts exactly as the river searches at its spring; in other words, the trial to discover the idea and a discovery around a discovery. It is the start to understand the work and the trial to change its outside space discussions, thus, it becomes a sort of a vital monologue aiming at freedom of work and freedom of atmosphere. The idea of transferring the existing, current principal for work implies a continuous ruin; therefore, the ruin is that of the structure, in the meaning that a new material is found for building my world. So the destruction and the trace have dissolved inside me and a comprehensive vision for things and for the infiltration to the essence of small things were created. Beauty is a value not implied in the piece of art is considered but it is clearly shown in its effect so the piece of art is considered a pretty proposal and a nucleus for a multi ends –argument form which it bounds for the trace direction. The idea is not emerged from emptiness as the understanding of subjects and contradicts between things and places, in addition to the understanding of the discovery of shapes movement principal and interaction with the new art happenings provides me with a comprehensive vision and a capability to step and pass toward forms .. 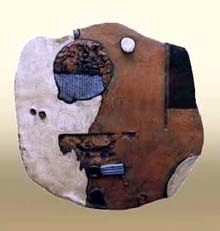 I SEE CERAMIC ART as a self-independent art, having its own forms, colors and structures. However, I declare my objection and disobedience to the old concepts, or the stereotypes of ceramics that are intended to be a utilitarian or applied art. Generally, there are two confusing aspects of ceramic: first, between the desire for expression and expression itself and the material for expression and, second, between construction and the material of construction. Therefore, I see ceramic art as not mental stimulation but, by composing abstracted ideas or idealistic shapes, it will continue as a marker for humanistic and spiritual values. A shape is a language, its words are written on the surface and color that must be poured in a new modern cast to help me understand all the things that 1 have formed and transformed, that is, to explain why I have allowed a dominating form to exist iII the artwork under a mask that seems characterless. It is normal that all shapes are made through the feeling of its inside volume; the work must have harmony and react with its dimensions and mass because its correlation will not be according to the subject itself nor to the involving emotions, but to the direct senses. That is why all my shapes are spontaneous and simple. When I start to create work, my hands work spontaneously and my eyes search in it, because clay as a substance has no meaning iI1 itself yet has a tremendous influence on me as a ceramic artist. I sense the originality of the artwork from inside - the shape and non-shape; and in order to stabilize the world by means of time and place, I try, in this sense, to abstract the beautifulness of touch in color, shape and non-shape before reducing it towards a visible world. I have a strong desire to distort the shapes I make because I find an extra freedom which pushes me towards art creation rather than towards abilities of the mind, although I wish to discover those abilities too; and so much of my work ends as disfigured structures. Because of the full awareness of the ceramist for his materials, the world and shapes around him, he is led to discover new shapes and structures rich in beauty. However, I always try to put my shapes and structures in a modern cast and I decorate the forms in relation to the modern humanitarian civilized world. My work can be categorized as decorated shapes, colored dances, free lines, renewed volumes, music and running away from oneself into a scattered self in disorder. 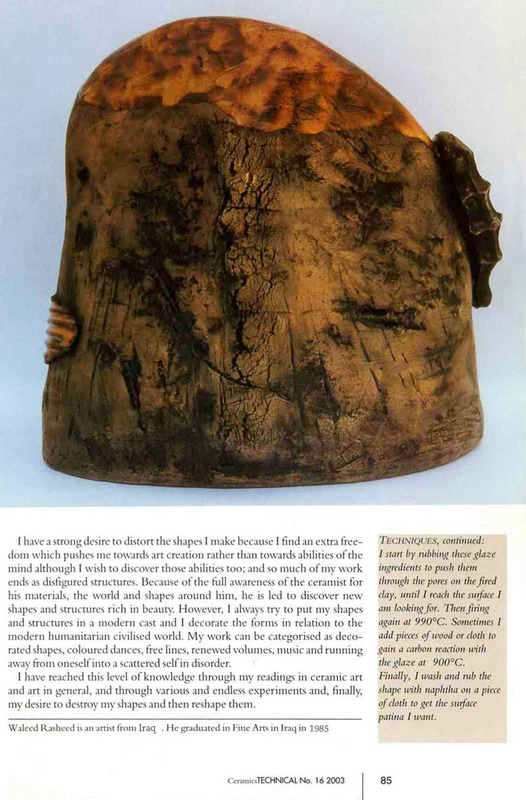 I have reached this level of knowledge through my readings in ceramic art and art in general, and through various and endless experiments and, finally, my desire to destroy my shapes and then reshape them.